Since the racial protest in Charlottesville, white supremacists have been on the front end of many social discussions both online and offline. From their ill-fated protest, we know that these supremacists a.k.a alt-right a.k.a neo-Nazis do not like Jews and African-Americans. A recent study now shows that these white supremacists do not think highly of Nigerians either. Psychologists Patrick Forscher and Nour Kteily in April 2017 interviewed members of the alt-right and interviewed them to get a profile of their movement. Using a sample of 447 alt-right members via an online survey, it was discovered that they do not think Nigerians have "evolved" much. As a matter fact, according to the research, Nigerians rank fourth in the least evolved group of people with a score of 59. Not surprisingly Hillary Clinton comes last with a score of 55. Muslims are also ranked 55 in the alt-right list. Feminists come in third at 57.
play Trump and Hillary Clinton during the second presidential debate of the 2016 election. At the top of the pole are obviously white people with a score of 92. Americans, men, Europeans, Swedes, Christians, women, Donald Trump, Republicans and Russians follow respectively. play President Trump answers questions about the violence at the Unite the Right rally in Charlottesville in New York. 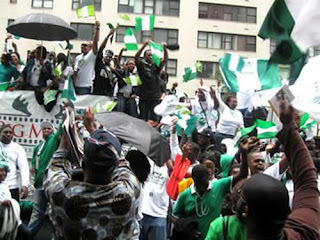 According to a 2013 census, there are 300,000 Nigerians living in America. This does not take into account illegal Nigerian immigrants living in the US. This figure makes Nigerians the single largest group of contemporary Africans in America. With the alt-right's hate for immigrants who they think are stealing their jobs, it is not much of a stretch to see why they hate Nigerians. In July 2017, CNN reported that a neo-Nazi was living in Lagos, Nigeria. Andrew Anglin is reportedly in Lagos and is wanted in the United States of America after he reportedly started a harassment campaign against a Jewish woman. Andrew Anglin is the founder of the white nationalist website The Daily Stormer. CNN reached out to Anglin who says he now lives in Lagos because “his rights to say what he wants are not limited."